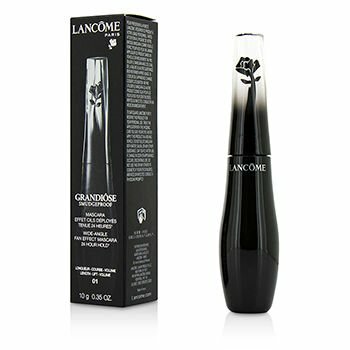 Lancome grandiose wide-angle fan effect mascara has the following features: for the 1st time in lancom history this patent-pending " swan-neck " wand and high-precision brush can grab lashes close to the roots to perfectly fan them out, corner to corner. Reinvents and unveils a new application technique that effortlessly creates perfectly open, full and even lashes starting with the first stroke, lashes are coated from root to tip. Adapted to suit different eye shapes, this mascara creates a spectacular wide-angle fan effect.an Innovative formula enriched with Lancome's exclusive native rose-cell extract. Captivating, eyes are simply grandiose.